San Antonio Spurs players celebrate their 104-87 victory over the Miami Heat in Game 5 of the NBA Finals to win their fifth championship. Seconds ticked off the clock and LeBron James sat at the end of the Miami Haet bench with his head in his hands. Reserve center Udonis Haslem had his arm draped around James' shoulder, as it was clear the three-peat championship run was over. Tim Duncan, Manu Ginobili and Tony Parker spent the entire year answering whether they were too old to make a run to the finals. All year the fielded questions about their stamina and their colossal collapse in last year's game 6. The San Antonio Spurs led by what ESPN calls; "the winningest trio in NBA postseason history," destroyed the Heat in game five winning their fifth championship 104-87. Spurs players stormed the court wrapping themselves in flags from their homelands as the Spurs leads the NBA in most foreign born players. LeBron James who led the Heat with 31 points and 10 rebounds had to admit that on this night the Spurs were the better team. "We had a great first quarter, but from that point on they were the better team, and that's why they're the champions in 2014," said James. For 12 months the Spurs coach Greg Popovich has thought about last year's game 6 and what could have been. "I've said many times, a day didn't go by where I didn't think about Game 6," Spurs coach Popovich told ESPN. "So I think, just in general, for the group to have the fortitude that they showed to get back to this spot, I think speaks volumes about how they're constituted and what kind of fiber they have." When soft-spoken center Tim Duncan was asked about the impact this victory had on last year's defeat, he said simply: "It makes last year OK."
San Antonio found themselves in the hole early as the Heat stormed out to build an early 16-point deficit lead but that wouldn't last long as the Spurs and routed Miami. Finals MVP Kawhi Leonard had 22 points and 10 rebounds for the Spurs, who had the arduous task of checking the James the entire series. The Spurs now have won titles in 1999, 2003, '05 and '07 and they almost another last year, but couldn't hold off the Heat. "We wanted to redeem ourselves. 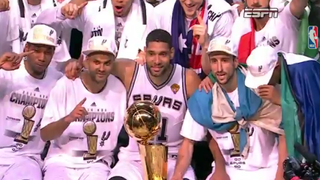 I'm just glad we were able to do that," Spurs point guard Tony Parker told ESPN.